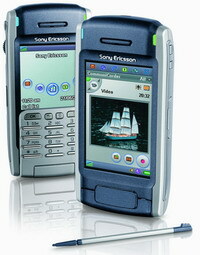 The Sony Ericsson P900 is successor of the P800 (which is currently sold by both Fido and Rogers). In many ways it’s the same phone, but it includes some rather useful upgrades that make it worth the extra couple of hundred dollars. But why am I calling this a micro-review, as opposed to my standard mini-review? With most mini-reviews I see the phone for 1 or 2 hours, and I try to put it through all of its paces. I didn’t see the P900 for all that long, and due to the complexity of its feature set I didn’t really get a chance to sample it enough to say as much as I’d like to. What I did pay attention to was the RF and audio capabilities of the phone, and so I’ll have plenty to say in that regard. The first thing that has changed from the P800 is the keypad. On the P800 the keypad was nothing more than a bunch of push-through buttons that made contact with the screen below. This was an okay idea, but the buttons had a very mushy feel, and they had no resounding click to let you know they’d been pressed. The P900 has a real keypad with proper electrical keys. If there’s anything I found that I didn’t like about the new keypad it was its size. Making the keypad smaller exposed more of the large screen when using the device in phone mode, but what we end up with is a keypad that’s small enough to fit on the tiniest cell phones presently on the market. The keypad feel was good, but the spacing was just too cramped. Like the P800 however, the keypad can be removed completely, and the phone can be used in pure PDA mode, which provides a simulation of a phone keypad on the display when you need to make a call. The emulated keys are good-and-large, and so you can actuate them fairly easily using just your fingers (no need to pull out the stylus). The screen is the same size on the P900 as it is on the P800, but it seems to have much better color clarity and brightness. Without a P800 to compare directly to the P900, this was only my perception of the screen. It still couldn’t match the quality, resolution, and sharpness of the screen on the Sharp GX22, but it was perhaps the best color display I’d seen aside from that phone. The camera on the P800 is also pretty good for a camera-based phone. It provides 640x480 resolution, and surprisingly it deals very well with varying light levels. I've attached a picture at the end of this review that was taken at Square One. 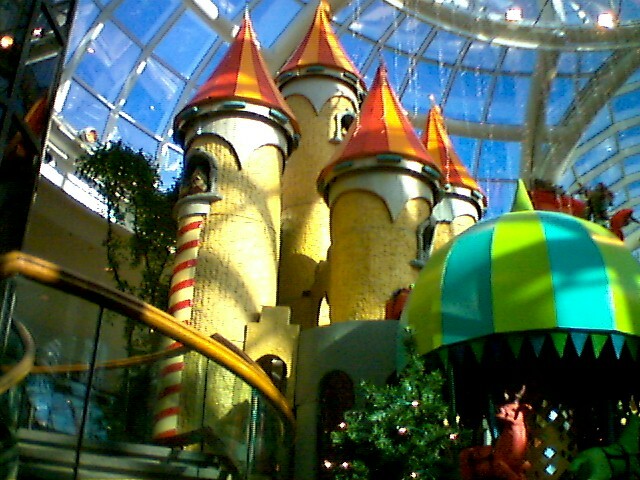 The sunlight falling on Santa's Castle represents a touch lighting condition for any camera, but the P900's seems to handle it quite well. This still isn't a particularly great substitute for a real digital camera, but it does markedly better than just about any other phones I've tested (with perhaps the exception of the GX22). Audio quality and earpiece volume have been noticeably improved over that of the P800. While the tonal balance is still a little on the tinny side, it wasn’t bad enough to rob this phone of getting an excellent rating for audio. Outgoing audio was also very good, and certainly the best I’ve ever heard on an Ericsson product. I would even go as far as to say that it was almost the best I’d yet heard, though I still give the nod to the GX22. RF sensitivity was excellent, just as it had been with the P800. In the Hall of Shame at Square One the P900 could pick up the network just as well as my Nokia 6310i. Unfortunately its ability to cope with weak signals wasn’t quite as stellar. The 6310i could sustain virtually interference-free audio long after the P900 started to suffer from noticeable frame errors. I didn’t get a chance to try the P900 in a moving car, and so I can’t give you any idea of how it might perform under such conditions. The P900 is easily the best combination of a PDA and a GSM cell phone that I’ve yet seen. It does both functions extremely well, and that’s always been an issue with these converged devices. Either they were great phones and lousy PDAs, or great PDAs and lousy cell phones. At over $1000 (Canadian) however, this isn’t the sort of phone many people will be able to afford, but if you have a need for this type of a device, its money well spent. The next picture was taken by a Nikon Coolpix 990 in 640 x 480 mode, to use as a reference. Note the colors, while nice-looking on the P900, are not a true representation of the colors on the castle. The Coolpix photo is a much closer rendition.